The winged pod began life as a model this time last year. The owner's were sold on the idea as a bedroom to compliment their cliff top house, and after price negotiations with a local building contractor work began in September. The skeleton is finished and they are about to give it a wild hairdo and bring it to life. 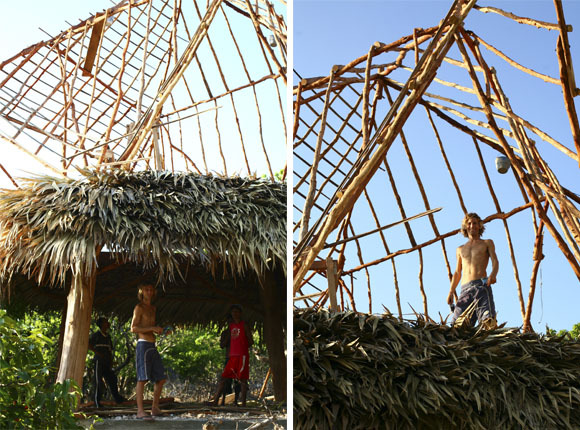 The lontar leaf roof and walls are one unit, with the largest opening facing west toward the ocean. Guests will enter the pod over a bridge and under the eastern gable. There have been serious misinterpretations of the plans which required rectifying, along with evolutions of detail throughout the project. The builders are impressed if somewhat perplexed, and the architect is very happy with the progress. Below the bedroom is a living space that will have a suspended super king daybed for committed lazing, and curved steps lead to a sunken outdoor shower behind the white rendered rock wall. The builder's are living on site under a tarp. They subsist on rice, two-minute noodles, coffee, palm syrup and small morsels of fish, and in between they smoke rollie cigarettes. The head builder's grand-daughter (and my namesake), Little Sally, is camping over and her pink shoes add a bright note to the men's mess. It would be quite the education for a three year old. The "little flower" totally destroyed the model that Tom had asked to be preserved for his collection.